Posted on January 27, 2017 at 11:06 am. Online poker could be illegal to play in Australia soon, but players Down Under aren’t going to sit in silence as it happens. The AOPA are fighting for online poker. 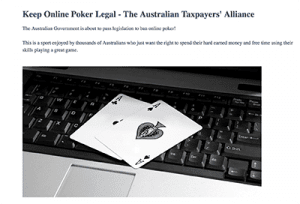 The Australian Online Poker Alliance (AOPA), a group created under the Australian Taxpayers Alliance, is fighting for their right to continue to play poker online as a new bill threatens the legality of the online pastime. The bill in question is the Interactive Gambling Amendment Bill 2016 which was submitted in November to Parliament by Minister for Human Services, Alan Tudge. His plans to tighten legislation weren’t new with promises to govern in-play sports betting taken up a notch announced seven months prior. But there was no indication he would be including international poker operators – which up until this point operated in a bit of a grey area. This has resulted in online poker being defined as a form of in-play betting in the wording of the bill, and will therefore become illegal. The World Series of Poker (WSOP) Main Event Champion, Joe Hachem, has said this legislation was hypocritical. “The fact that our country allows online sports betting and horse racing so freely, which are both truly gambling, and doesn’t allow online poker is truly embarrassing,” he said in an interview on PokerNews. The poker industry has already begun responding to the legislative move, with one of the biggest poker sites, 888Poker, withdrawing from the market. PokerStars, a poker site which garners strong revenue from the Australian market, also announced they would be withdrawing if the bill passed. Tudge has said directors of companies found violating the bill will face being put on the Movement Alert List which will block these people from entering Australia, while the company itself will face fines of up to $1 million per day from the Australian Communications and Media Authority (ACMA). But since PokerStars earns a large majority of their revenue from Australian players, we can see why they are waiting up until the last minute. Anyone can join in and help the AOPA reach the goal for 2500 signees by signing your name on the petition on change.org, or send an email to your local MP.